The next Beer & Hymns sing will be held Sunday, November 4, 6:00 p.m. at Mo’s O’Brady’s in the Huffman Business Park next to Carrs/Safeway. This a tremendously successful event which features camaraderie, and singing wonderful hymns, something many of today’s churches no longer offer. Retired Lutheran Pastor Dan Bollerud has encouraged this event into a tremendous asset for the local community. There is no charge to attend, but donations are accepted for Lutheran Social Services of Alaska. The previous Beer & Hymns raised over $11,000 in just two-hours. Mo’s food is always delicious and features many “down home” favorites. I urge you to get there early or you might not be able to find seating. At the last Beer & Hymns I was among others who were unable to find seating and left. Personally, I’m not eager to stand for two-hours during a hymn sing. In my opinion, this wonderful event has possibly outgrown its venue and should consider moving. I hope this event is as successful as the last one! This entry was posted in ADN Articles and tagged Beer & Hymns, LHHS, Lutheran, Rev Dan Bollerud on November 3, 2018 by Chris Thompson. Beer and Hymns – Fun and Successful!!! Last Sunday night featured fellowship, conversation, tasty food, and wonderful hymn singing. Oh, and the best part, over $11,000 was raised in two hours by this cheerful crowd of Christians from multiple churches and denominations. The proceeds of the fundraising went to Lutheran Social Services of Alaska (LSSA) whose executive director, Alan Budahl, made the round of tables with an iPad collecting donations of those present. Alan mentioned how great the need was at this time and how helpful these contributions were in meeting that need. It was a capacity crowd in Mo’s O’Brady’s restaurant. Empty seats were in short supply as the evening progressed. Pastor Dan Bollerud led the singing using a new song-sheet compilation of hymns old and new. Jamie kept up the tempo at the piano, while John filled in with guitar and harmonica. I feel like a broken record when I say it just keeps getting better and better, but it’s true. Trust me, you won’t hear hymn singing like this in most churches. Pastor Dan told me the next Beer and Hymns will likely be in the spring, and many of us can’t wait. While many local evangelicals concentrate on getting people saved and baptized, our friends the Lutherans fill our community with love, grace, and a social gospel which reaches out to the poor and those in hunger. Thank you Lutherans for this expression of love for the Other. This entry was posted in Church Visits Blog and tagged Beer & Hymns, LSSA, Lutheran, Lutheran Social Services of Alaska, Lutherans, Rev Dan Bollerud on October 14, 2017 by Chris Thompson. As I visit churches, many sermons I hear lack practical application to our daily lives with demonstrable clear takeaways. They don’t give biblically down-to-earth advice and admonition to guide the daily lives of Christians, to encourage and enable them to be as distinctive as were the early Christians. In my church visits here, I recall hearing only one sermon full of practicality containing admonition for maintaining one’s physical, mental and spiritual health. Obesity, diabetes and heart disease, for example, are on the upswing. Yet, many church dinners tend to be unhealthy, reflecting a lack of knowledge about the link between diet and disease. Why, for the most part, would churches remain silent on practical advice and knowledgeable practices to their flocks? Last Sunday, I was treated to another practical sermon at The Crossing in Chugiak. Titled “An Honest Day’s Work,” it was given by Dave Lemaire, a layman with deep roots in men’s ministry. A lifelong Alaskan, Dave has operated businesses and worked in a variety of positions in the transportation industry from the Kenai Peninsula to the North Slope. In July, I wrote about Dave and Michelle Lemaire’s Copper River Float Ministry in this column. Introducing Lemaire, The Crossing’s senior pastor, the Rev. Brad Rud, said he’d invited Dave to speak about being a Christian and work. My first-ever sermon on this topic, it fascinated me. Early on he cited Ephesians 2:8-10: “For it is by grace you have been saved, through faith — and this is not from yourselves, it is the gift of God not by works, so that no one can boast. For we are God’s handiwork, created in Christ Jesus to do good works, which God prepared in advance for us to do.” Lemaire stressed that we’re “God’s handiwork,” his masterpiece. Other key texts used to support his talk were Colossians 3:22-4:1, Titus 2:9-10, 1 Peter 2:15-21, and 1 Timothy 6:1-2. Supported by this Scripture, he proceeded to provide a framework for employer and employee conduct and relationships. Breaking down the day of the average American to 8.9 hours working, 7.7 hours sleeping, 2.5 hours of leisure, one hour on household needs, 1.2 hours caring for others and one hour of doing other things, Lemaire said work offers our best opportunity to affect more people for Christ than any other daily activity, adding our work should say much about our character. If we’re doing an honest day’s work, people will see Jesus in us. Throughout his talk, Lemaire told of multiple work instances in his and others lives where employers saw honesty in their work habits, opening the door for employers to understand true Christians can represent Christ just by performing their work justly. On the part of employees, Lemaire underscored the toll employee-theft takes on businesses — $20 billion yearly, while break-ins and thefts by customers’ cost businesses — $13 billion yearly. He stressed employees should not steal, be dedicated to their employers and work with sincerity, as God is always watching, and others too. In a past work life, I worked with businesses to address time-theft, estimated by many researchers to be 10 percent of what the average employee is paid. While not quantified specifically, Lemaire addressed time theft, time wasted on the job, texts, emails and other personal business at work supported by Scripture points. Working responsibly during our work time, not wasting time, being responsible with employer resources, being obedient and respectful, giving our best, being loyal and letting our work point people to Christ were all Scripture-driven points Lemaire underscored. He summarized the gist of being a true Christian in the workplace by this statement: “We make the message of Christ effective in the workplace without preaching the Gospel.” Personally, I’ve worked for “Christian” employers who were anything but Christ-like in the workplace. He stressed fairness in the workplace works both ways. Similarly, employers should treat employees in the same way employers themselves wish to be treated. This means being honest with them, paying them fairly and with integrity. Employees need to see employers demonstrating their own work ethic and making good business decisions. He cited the need for employer loyalty to employees, by not threatening them or always appearing to be looking for replacements. Lemaire’s sermon can be watched online at vimeo.com/187096414. Covering much ground in 33 minutes, he offered great advice for anyone. Think of it. If rightly followed, Bible studies, face-to-face witnessing, or personal testimonies would be of less importance if more employees and employers followed this advice. In an encouraging manner, Lemaire shared stories of employees expecting to be fired for making mistakes, but not losing their jobs when they honestly came clean with their employers. This message needs to be heard at many more churches. Hymn singing at the “Beer and Hymns” events has proven to be a blessing to those who participate. Unfortunately, I’ve heard Anchorage pastors denounce this event as a beer bash; it’s anything but. Rather, it’s a coming together of people of faith to sing praises to their God and to show financial support for Lutheran Social Services of Alaska. Participants pay for their meal and beverages, sing hymns for two hours and donate money. Between $6,000 and $10,000 are raised in this short time several times a year. If you like good food, great hymns and heartfelt fellowship, the last Anchorage Beer and Hymns evening for 2016 will be held 6 to 8 p.m. Sunday evening at O’Brady’s in South Anchorage. I’ll be there too. Chris Thompson is a religion scholar who visits Anchorage-area churches and writes about his experiences and matters of faith on his blog, churchvisits.com. This entry was posted in ADN Articles and tagged Beer & Hymns, Copper River Float Ministry, Dave Lemaire, Rev Dan Bollerud, The Crossing on October 16, 2016 by Chris Thompson. During my forays into the local faith community in 2015 I experienced an intriguing mix of sights, sounds, venues and celebrations. This week I’ll briefly describe some that made lasting impressions. Next week I focus on my perennial quest regarding what I’d like to see churches tackle in 2016. These impressions are mine alone, and omission isn’t intended as a slight to any faith-based organization in Anchorage. As the years go by, I’m increasingly enthusiastic when local faith organizations and their members go out of their way supporting charitable causes such as Thanksgiving Blessing, Crop Hunger Walk, food banks and food distribution programs, kids programs, etc. There is sufficient need in our community, and these efforts show that, for the most part, Christian organizations walk the talk. When Christ Our Savior Lutheran Church periodically holds two-hour Beer and Hymns events, more than $5,000 is raised for Lutheran Social Services of Alaska. Church food drives are incredibly successful too, such as when St. Mary’s Episcopal Church collects donations of more than 4,000 jars of peanut butter plus other food items during the year. The Archdiocese of Anchorage held several important celebrations this year. One marked the 100th anniversary of Holy Family Cathedral, and the 50th anniversary of the Archdiocese of Anchorage. Many artifacts of local church history were on display, accompanied by colorful presentations by many local Catholic leaders. The ceremonial Mass at Our Lady of Guadalupe marking Archbishop Roger L. Schwietz’s 75th birthday (and 25th anniversary of his ordination as bishop) was full of music, co-celebrating archbishops and bishops, and many priests. The investiture ceremony of the Royal Equestrian Order of the Holy Sepulchre, presided over by a cardinal, was a spectacular peek into church history. The Eagle River Institute at St. John Orthodox Cathedral during August afforded opportunities to learn about orthodoxy, and its history, especially Syrian-born Rev. George Shaloub’s lectures on Middle Eastern Christianity. With the Syrian refugee crisis in the headlines at the moment, it’s too bad more local Christians did not hear his messages. Vespers, held after supper each day, provided music and liturgy harking back to apostolic times. A recent visit to St. Tikhon Orthodox Church delighted me. The hour and a half liturgy was supported by an all-male choir singing in four-part harmony. The Russian Christmas celebration at St. Innocent Russian Orthodox Cathedral was filled with music and liturgy, my first experience with starring, a beautiful Orthodox tradition brought from Ukraine. New churches (church plants) meeting in middle schools were a pleasant visit focus. Clark, Begich, Wendler, and Hanshew middle schools were the focus of those visits. They pay a standard Anchorage School District rental rate for use of the multi-purpose room for adult meetings and classrooms for the younger kids. Churches must bring everything needed and set up every Sunday, taking it all down after, but it works beautifully. Many of these locations provide better settings than some of our local churches. In each of these services, the proportion of millennials was greater than in an average church. I’ve been personally blessed by the number of these services I’ve attended, never feeling the absence of a dedicated brick-and-mortar church as a disadvantage. Earlier this year, Anchorage Faith and Action Congregations Together challenged the state Legislature with words and prayer at the Legislative Information Office to expand the Medicaid system on behalf of the working poor who slip through the cracks. AFACT, a local coalition of 14 local congregations, worked tirelessly on behalf of expansion. In the end, expansion of the health-care program did happen. When I attended the AFACT celebration at St. Anthony Catholic church in early fall, I was impressed with the passion this dedicated group expressed. I was especially taken with Pastor Julia Seymour’s remarks referring to “social junk.” She’s right. It’s so easy to criticize and ignore those among us we regard as not worthy of our consideration. However, everyone counts in our society, or it begins to rot from the center. My interview with All Saints Episcopal’s Rev. Norman Elliott as he reached his 96th birthday was a true delight. His tireless devotion to his church, and the spiritual lives of those in our hospitals, should be an inspiration to us all. It’s not often we get to know a living church legend; Elliott certainly fits the bill. His stories of pastoring and teaching in the villages, coupled with flights of daring in the parish airplane, are fascinating. Whenever he digresses into the poetry of Geoffrey Anketell Studdert-Kennedy, which he manages to slip into most sermons, he becomes a different man. Elliott is devoted to God and to his church. Retired Archbishop Francis T. Hurley celebrated his 45th year as bishop this year. I’ve had the privilege of interviewing him several times, and like Elliott, he was a flying priest who ministered to a far-flung area. Both have interesting tales of serving God by airplane. The Shiloh Missionary Baptist Church celebration of Pastor Alonzo Patterson’s 45th anniversary as their pastor and 66th anniversary of being a pastor was a warm and effusive display of love for their pastor. Many guest pastors were on hand to add their congratulations and thanks to God for Patterson’s many years of service. The musical tributes were warm and from the heart. It was an exceptional event to have experienced. This entry was posted in ADN Articles and tagged AFACT, All Saints Episcopal, Alonzo Patterson, Archbishop Hurley, Archbishop Schwietz, Archdiocese of Anchorage, Beer & Hymns, Catholic, Christ Our Savior Lutheran, Eagle River Institute, Fr Norman Elliott, Holy Family Cathedral, LSSA, middle school, Our Lady of Guadalupe, Shiloh Missionary Baptist, St Innocent, St John Orthodox, St Mary's Episcopal, St Tikhon on December 25, 2015 by Chris Thompson. Often it appears I’m critical of everything going on in the church community. But I’m just as eager to highlight ways churches and religious organizations support local communities throughout Alaska. Here are some examples of ways churches support community organizations to show their love for God and others. For the past four years, Baxter Road Bible Church has actively promoted a Christmas giving program that is not self-directed. Its theme is simply “It’s not your birthday. Christmas is Jesus’ birthday and our gift to him is to help the poor.” All the money that members give to the church in December is used for this program. It funds community programs nominated by church members. The base of recipients is stable but some are added each year. Bob Mather, the church’s senior pastor, said “The more generously BRBC members give, the better shape our church finances are. There are no monetary problems due to our December giving initiative.” Last December, more than $60,000 was donated, and overall, more than $200,000 has been donated the past four years as the program has grown. One of the Catholic Church’s local initiatives through CSS is the Brother Francis Shelter. The shelter provides nighttime sleeping accommodations and a meal for those without a place to call home. It provides active assistance to their clients to help them redirect their lives and become gainfully employed in the community. If they choose not to do so, they are limited to 30 days at Brother Francis Shelter and then must be gone for 30 days until they are eligible to return. These services are provided at tremendous cost to area Catholics, aided by other community organizations as well. After being in Anchorage for 15 years, I perceive the services are taken for granted. The shelter deserves strong community support. One need not be Catholic to support their mission. Bean’s Cafe, like Brother Francis Shelter, has become a local fixture, which I also believe is taken for granted. However, many churches wholeheartedly throw their support behind the Bean’s mission of feeding the hungry, and housing them during cold nights when Brother Francis is full. My very first experience with Bean’s Cafe was in responding to a request by Amazing Grace Lutheran Church for volunteers to serve meals at Bean’s on a Saturday. I enjoyed my fellowship with other volunteers becoming a regular volunteer for a while. Volunteers from St. Benedict Parish impressed me one Saturday, motivating me to visit their church. On some Saturdays, I found my help was needed in prepping food for future meals in the kitchen. I’ve always enjoyed every minute I’ve spent volunteering at Bean’s. Many churches support its mission. In August, I was a substitute teacher at Campbell Elementary School for several weeks. Walking into the staff lounge I was amazed to see a number of ‘thank you’ boxes of pastries and donuts from a local bakery. I contacted Rev. Brent Williams about this growing church to find out more. Williams told me they’d delivered 44 boxes to 30 schools that day and that TrueNorth regularly delivers these gifts to schools, nonprofits, and local businesses. Shedding further light, Williams said “It is a normal part of our staff time each week. It’s one thing to sit in a room and strategize about how to reach our community. It’s completely different to actually create a missional environment. It starts with those called to shepherd the body of Christ if it is ever going to be “normal” for our church.” Who wouldn’t be attracted to a body of believers who not only talk the talk, but also walk the talk? Thanks for doing this, TrueNorth. My Sept. 12 column highlighted the “Beer and Hymns” fundraiser of Christ Our Savior Lutheran Church, which was held Sept. 21. The purpose of this fundraiser was to financially support the work of Lutheran Social Services of Alaska, as outlined in my column. The evening at Mo’s O’Brady’s was a joyous time of food, Christian fellowship, and some of the best hymn singing I’ve ever heard in Anchorage. It was well attended with people arriving 45 minutes before the 6 p.m. start time. Last Sunday, I attended a local church to observe their services, be treated as a guest, hoping to learn from them and to share the results of my visit with the local community. Unfortunately, during the sermon, the pastor outrageously characterized this fundraiser as a beer bust. Nothing could be further from the truth. Over $7,000 was raised for LSSA, fellowship among Christians was high, and a strong sense of Christian community and hospitality was evident. If a church, in a couple hours of fellowship and singing can raise this kind of money, uphold the standard of “being the church in the world,” as Rev. Dan Bollerud terms it, maybe there is hope for churches to represent themselves rightly to the world. These churches and religious organizations deserve our thanks, respect, and support for their significant contributions within our local community. Because of them Anchorage is a better place. They are in the vanguard of leading Christian witness by demonstrating who their neighbor is. This entry was posted in ADN Articles and tagged Baxter Road Bible, Bean's Cafe, Beer & Hymns, Brother Francis Shelter, Catholic Social Services, Christmas Giving Program, LSSA on October 4, 2014 by Chris Thompson. Many readers have written asking for names of churches offering music formats not harsh, overly loud, consistent with Scripture and based on spiritually uplifting hymn format singing. Many evangelical churches used to offer hymn singing formats where a 10- to 15-minute period of congregational singing, called “song service,” commenced the worship service. This style is dying out for lack of gifted song leaders and musicians who can perform this music in a spirited, uplifting and inspired fashion. When done well, a song service can be the most member-active portion of a church service. Liturgical churches Catholic, Presbyterian, Lutheran, Episcopal, Methodist and similar congregations may offer some of this style of music interspersed throughout their services, but it is often performed in a doleful, draggy funereal manner. I recently received an email from a new Anchorage resident, transplanted from another Alaska city, looking for a good song service music format. Who has the Best Song Service? Not many Anchorage churches offer what you are looking for. Many churches have dumped people-friendly song services for entertainment-format praise bands and choirs. I personally know several Anchorage churches that offer what this reader is looking for, and do it well. A great song-service and a well-delivered sermon are what many people seek in a church service. Instead of offering a search of “best church singing” send an email request to ChurchVisits@gmail. com to obtain a list of churches offering great song services. One of those churches is Great Land Christian Church, which offers one of the best song services in town. It is led by a group of young singers who present an a capella group of hymns and songs that are theologically strong, not Bible camp-style music and so well done that virtually every person in the congregation can be heard following their lead and singing. The two “Beer and Hymn” sings offered by Christ Our Savior Lutheran Church in 2013 offered some of the best hymn singing I’ve heard in many years. 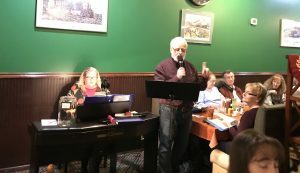 More than a hundred people sang great hymns of the church for several hours with unrestrained joy in a restaurant setting while raising close to $10,000 to support the Lutheran Social Services food bank. Only a piano delivered the musical accompaniment, while the singing was led by a talented pastor who knew how to sing and lead the music. Occasions like these are infrequent but indicate many seek participative music, not theologically weak “music as entertainment” delivered at eardrum blasting levels. Seek and you will find! Chris Thompson is a religion scholar who visits local churches and writes about his experiences and matters of faith on his blog, Church Visits, at adn.com/churchvisits. Email him at churchvisits@gmail.com. This entry was posted in ADN Articles and tagged Beer & Hymns, Christ Our Savior Lutheran, Great Land Christian on February 1, 2014 by Chris Thompson. 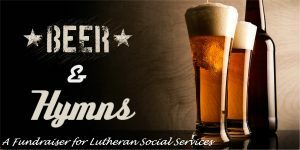 Christ Our Savior Lutheran Church (COSLC) Christ Our Savior Lutheran Church (COSLC) is hosting its 2nd Beer & Hymns session at Mo’s O’Brady’s, 1501 Huffman Rd., Sunday, November 10, 2013 at 6:00 p.m.
It’s simple. You come, admission is free, buy food from O’Brady’s tasty menu, along with your favorite beverage, including adult beverages. Eat, drink, and sing during a this two-hour hymnfest. Freewill donations to LSSA’s food bank can be made during the hymn sing (no pressure). Last year just under $5,000 was raised. LSSA is well known for making a sizable dent in meeting the needs of those in our community who cannot feed themselves and/or their families in these trying times. COSLC members are among some of the most personable and friendly church members in town. Pastor Dan Bollerud shares that “God is not confined to our churches. Worship comes in many forms. Come join us for food, fellowship, and fun, knowing that with Christ and your brothers and sisters, all are one” . I’ve come to know Pastor Dan as a marvelous connector, has a great voice, and leads the music during the singing. He can also direct you to some great brews. I guarantee you’ll make some new friends at this event. I’ll also be there enjoying this wonderful time, and recording my impressions for the Church Visits blog. You can download this illustration in a larger format below. This entry was posted in ADN Blog and tagged Beer & Hymns, Christ Our Savior Lutheran, LSSA, Rev Dan Bollerud on November 9, 2013 by Chris Thompson.